I haven't had a chance to. But I'll put it on my to be watched list. I'm in the middle of ripping a bunch of videos and that's also the computer I watch movies on, so I'll have to schedule some time. Kime-hime in a dress. I think I just died from the mental image. I'll take a look tomorrow when I'm more awake. I had PT way too early today and am going to head to bed in a minute or three. Sounds like Dori and Sato??? Ok. But really, watch it. It's awesome. Wait til' you see Inui's seiyuu, he looks so much like a victorian or something woman, but to sound and act like one... ^^;; *points at icon* that's how Sato-chan looks in Magdala. Okay, just have to hook up the other computer. 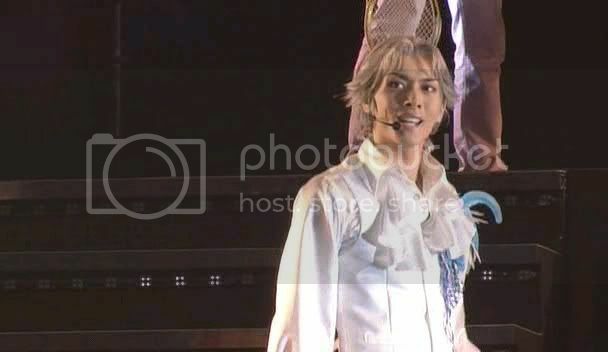 I actually need to do that to upload the Fuuma musical and the backstages and second disc. Tomorrow. Never would have picked them out. But speaking of seiyuutachi (is that a word? oh well, I'm the one who made up bakatachi) have you watched the 100 song marathon for PoT? There's one Rikkai Ro and I can't figure out. I already knew about Ryouta, since I've seen the Kamen Rider series he's in, and Akaya's seiyuu, I could pick out after a while, since I heard the song before I watched TeniPuri. (we could say it's a word, senpaitachi is one, after all) Yeah, I have. (a couple of times) Which one of them? I need to get around to downloading the Kamen Rider shows. There's just so many of them and I don't know where to start. It's the first Rikkai seiyuu after Kentarou. I'm thinking it's Akaya, but it could also be Jackal. They're the only two I can't account for. That Super Sentai that Mao-kun is in kills me. I'm old enough to remember the original Voltron and Power Rangers. Okay, that's what I really need as the page I got Mao's show from has all the Kamen Riders on it, I just didn't know which one to watch first. I think I read somewhere that the original show is about as old as I am, or maybe even older. I'd have to go back and look. That's who I thought, but without Jackal there, I wasn't sure. I know what Marui's looks like (thanks to Tezzino). Sanada threw us until he said tarundoru. I haven't seen it yet, but I have to. I wonder if it was in the one he is in or the one Zukki's in that Arayan's the main villain in.. Hmm... I think I have that one on my portable harddrive. Power Rangers are an americanized version of Kamen Rider or was it Super Sentai, right? I have no idea what Voltron is, though. Noazumi. I have a cd I'll put up for download. Tezz has another. The first Power Rangers were cool. Then they went downhill. I'm not sure of the history for them, but the english voice actor for Ichigo in Bleach was one of the rangers for a while. Voltron. The lion one was the original. Ohhh, nice. I'd love to have some songs by him. Sweetness. Arayan was dressed in black, anyways. I think he was in the one Zukki's in, though. Mao-chan is in the Tenshi-one,I think? *pokes* Oh, you. So many of them...Getting confused. Oh, wait, maybe that's just the weather and I worked nine hours of nothingness today. Meh. Yeah, he is. And if it wasn't for him and Ono-kun, I don't know if i'd watch it. Well? *looks innocent* It is Ba-chon. Yeah, might as well. I don't think I could watch them again.